It struck me how blessed I am to have been taught THE TRUTH from the time I was born. Many people do not have that privilege. I must never take it for granted. As I scroll through facebook, I am often grieved by the posts of friends, many of whom name the name of Christ, yet their lifestyle is so worldly or the things they think are OK are totally against the Word of God. 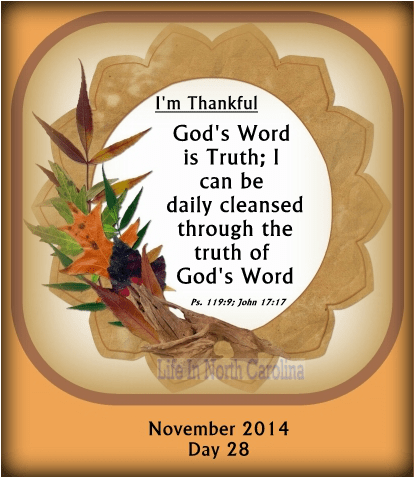 It is obvious that the truths of God’s Word have not been instilled in them. It is not that I think I am better than anyone, just grateful, that I was taught the Bible from a very young age. But those truths are still there for anyone and anyone who desires can know the truths of God and begin now to instill them into their hearts and minds. I am convinced that if we do not instill truth into the hearts of our children and grandchildren from the time they are born, it is most likely they will not wholly follow the Lord.